Fashionistas in the vibrant cities, London, Amsterdam, Stockholm, have been spotted wearing stripey loops around their elegant necks. Living in a remote part of northern England, well away from such captivating retail temptations, here are my instructions for making your own double-thick high necked version of this stylish accessory. We like to use remnant skeins of ColourMart’s finest cashmere and merino yarns. It is so soft, it’s unbelievably snuggly. You will love this if you make one too. For all you sensuous process knitters, it’s a slightly piquant beginning requiring peace and a wee bit more of a piquant finale where you’ll need some concentration, filled in the middle by a soft relish of comforting, relaxing knitting, perfect for taking to your knitting group or telly-watching, and not too big to carry on the bus or Metro. • A small pile of little balls or lengths of yarn and two left-over full balls of some very soft non-itchy DK yarn. Quantities? The orange in the sample one is approx 50g of ColourMart DK cashmere merino from what they call a scrap set. The tweedy grey is approximately the same amount. I suggest you get two different but toning colours like these to make the backbone of the pattern, so approx 50g of each will be enough. For the contrasting stripes, 20-30g will be enough for each colour. This Loop uses six colours, two main colours (MC) another four contrast colours (CC). • a good length of scrap yarn, any smooth cotton or bamboo, in a completely different colour. • one 3.5mm circular needle (min 60cm long) or 5 double point needles (dpns), whichever you prefer. • a 4mm crochet hook. You can manage with a bigger one if you haven’t got that exact size. • a large blunt needle for finishing. And for the yarn as used in the sample in the photographs: ColourMart’s website and their eBay Shop. Feel free to ask any questions in the comments thread here or in our dedicated Notes and Queries thread for the Loop on Ravelry. Warm and grateful thanks to the lovely Claudia aka Toastbrot for allowing use of her photograph in this pattern. 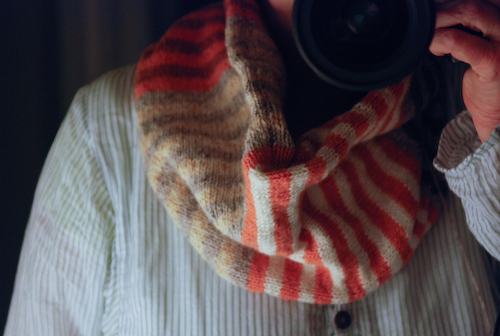 This entry was posted in Paid Patterns and tagged cowl, Easy as pie, Loop, Million Stripes Loop. Bookmark the permalink. I think this is beautiful and can’t wait to make it in January. Thank you for the pattern. Can I ask you how you finish the ends on the inside please? I’m a new-ish knitter and haven’t made anything striped yet. Thank you. It’s a really good question & you’re not the first to ask. There really are very few ends if you follow the colour sequence. Don’t cut the yarn between each set of four rows – just carry the second colour up the inside ready to use it in your next stripe. Don’t pull it tight, leave just enough to run it up the back of the purl stitch on the inside. So in one block of two colours, there will only be a maximum of 4 ends – one at the beginning of the first stripe, one at the beginning of the second, and the same at the end of that block. When you start a new colour block of two different colours, wind the yarn from the previous stripe in at the back of your work so that it doesn’t show. Just hold it between the active yarn and your knitting for a few stitches, say about an inch or two, then snip off. Do the same with the new yarn you join in for the second stripe in the second set. Weave in the ends as you go and you won’t have to sew them in after. But there will only be 4 ends for each set of stripes to weave in, and if you do that as you go, there’ll only be one when you’ve finished. If you use a different pattern of stripes to this, you might want to cut your yarn if you find yourself having to carry it a long way up the back. But if you have plenty of yarn, I wouldn’t worry, just carry it loosely anyway. If you make it loose enough, it’ll be fine, and will add to the warmth. Please feel free to ask more questions at any time. Sometimes the simplest looking patterns can be a bit of a puzzle, especially if you’re new to it all. Hello, sorry for another newbie question. For the very beginning, do I do a round of all knit stitches once the crochet bumps are on the needle, and then the first 4 round stripe in the k55/p1/k55/p1 pattern? So 5 rounds in total for the first stripe? Thank you, and a very happy New Year! Hiya! You need 4 rounds for each stripe, so your pick-up-and-knit from the crochet bumps is round 1, then do 3 more so you have 4 altogether . Then change colour. Keep the purls going from the beginning and throughout. Happiness of the season to you too! I’m not affiliated with them, just have one from Anthropologie and found your site through Google. Hey LJ – how helpful of you – thanks very much for commenting and letting us know! There is an Anthro knock-off pattern called Rayures available from Quince & Co yarns, and by the look of that it’s exactly the same. I made sure this pattern is different in several respects to the original, because although I’m more than happy to acknowledge the influence, I’m not comfortable with copies. At £54 it’s definitely worth buying one from Eribe! Beautiful cowl – have seen 3 so far and all gorgeous in their own way!